Who Else Will Return for the House Finale? Another familiar face is on her way back to Princeton-Plainsboro, but the overriding question remains: WHY? 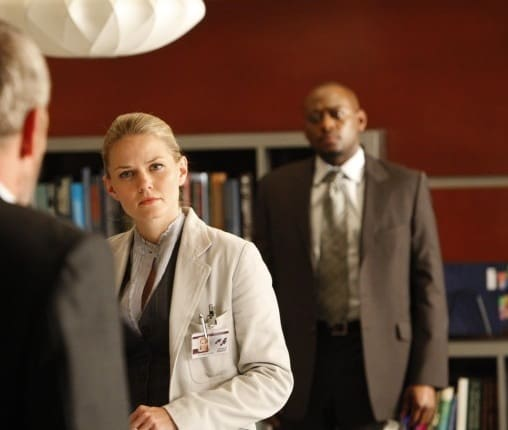 With Olivia Wilde and Amber Tamblyn both confirmed for the May 21 House finale, TV Line now reports that Jennifer Morrison will also reprise the role of Cameron on the series concluding episode. The Once Upon a Time star was last seen on season six, divorcing/bedding Chase. Considering these cameos, and the title of the finale ("Everybody Dies") and the diagnosis of Wilson this week, it's hard not to imagine that many characters aren't returning for a funeral. Another major clue: Kal Penn will also appear on the finale. And Kutner is dead. Chase: Did you ever love me?!? Chase: Thank you for finally telling me. Lucas: I'm dating Lisa Cuddy. Permalink: I'm dating Lisa Cuddy. Seriously? Cool, huh?